Traditions at Chesterfield, a Smart Growth community, hosts Thanksgiving food drive to benefit local food bank. Traditions at Chesterfield is hosting a Thanksgiving food drive until November 19th. “With the holidays fast approaching, we would like to take this opportunity to give backto the community by helping those less fortunate,” said Paul Csik, Senior Vice Presidentfor American Properties Realty, Inc. Traditions at Chesterfield, an award-winning Smart Growth community in Chesterfield, is hosting a Thanksgiving food drive to help those in need. Non-perishable donations can be dropped off from now through Sunday, November 19th at the Traditions at Chesterfield Sales Office, located at 7 Borden Lane, Chesterfield, NJ (GPS: 38 Old York Road, Chesterfield). The Sales Office is open from 10am to 5pm daily. All contributions will be donated to a local food bank. Those interested will also have the opportunity to tour the available model homes and learn more about quick move-in opportunities. The Single-family Classics collection at Traditions at Chesterfield, priced from the low $400s, offers nine home designs with three to four bedrooms, up to three-and-a-half baths, two-car attached garages and up to 3,654 sq. ft. of premium living space. Optional finished basements with nine-foot basement ceilings are also available. Only a few townhomes remain at Traditions at Chesterfield; all are available for quick move-in. Floor plans offer up to three bedrooms, three-and-a-half baths, recreation rooms, entry level walk-out or walk-in basements and one-car garages. As an added benefit, townhomes have no homeowner association fees and are priced from the $320s. Traditions at Chesterfield is ideally located in Chesterfield, voted “#1 Best Place to Live in Burlington County” by Philadelphia Magazine. It is also convenient to West Windsor, Robbinsville, East Windsor and Monroe. The New Jersey Turnpike, I-295 and Hamilton Train Station are all easily accessible to Traditions at Chesterfield for commuting to Philadelphia or New York City. Residents will find entertainment at nearby Six Flags Great Adventure and Mercer County Park and shopping at the Jackson Outlets. Chesterfield is also recognized for their top-rated, state-of-the-art elementary school (K-6), located within walking distance to Traditions at Chesterfield. 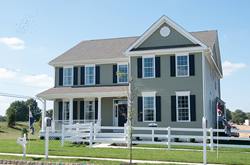 Interested homebuyers can visit the Traditions at Chesterfield Sales Office, located at 7 Borden Lane, Chesterfield, NJ (GPS: 38 Old York Road, Chesterfield). The Sales Office is open from 10am to 5pm daily. Schedule an appointment with an on-site sales consultant by calling 609.424.0026. For more information, visit http://www.TraditionsAtChesterfield.com. The Principals of American Properties Realty, Inc., have been involved in the creation of residences ranging from luxury single-family estates to master planned communities of apartments, condominiums and townhomes. This talented management team looks forward to adding Traditions at Chesterfield to the portfolio of award-winning communities that successfully delivered the dream of affordable and luxury housing to thousands of residents from New Jersey to California. Every home is built with the same impeccable attention to detail, quality craftsmanship and unique design at an extraordinary value. Each home is delivered with a new home warranty and outstanding customer service. The experienced management is committed to earning the trust of each and every homeowner in providing a quality built home that will be enjoyed for years to come.